If you had a wish in your dreams to fight like a Ninja, Facebook application game Chat Fu Ninja will make it true for you. Log on to your Facebook account, where you can now play Blot’s Chat Fu – an interactive game with fists of words. You and your opponent both are Ninjas here, but your opponent would take time to realize it. The game functions through the Facebook ‘chat’ option, where you choose your enemy and select the “Fight”. There are a range of categories like, Food, Cartoons, TV and Pop Culture from where you have to make your friend say a word that relates to one of these categories but are not falling under the “trap words”. If one uses a trap word, he loses the game. So remember, not only fists, even words hurt. 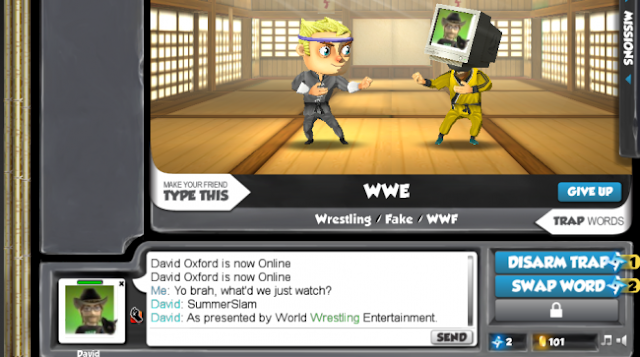 Chat Fu Ninja game intrigue will go like this: Suppose once you choose the category “TV”, you get an instructive message to ask your partner to type WWE, they will also show the trap words, which would be like Wrestling, Fake or WWF. So, if your friend chooses from one of these to write, you lose your point. The fight on the screen goes on with you and your partner typing words. If you score a proper fist, coins come out, with which you can buy more fighters for yourself. If you earn better, you can buy ‘ninja stars’ that will help you in disarming the trap words or it can also change the target word altogether. You may also choose to “give up” if the fight is taking a bad turn. Then there’s this privilege in this game where you are clearly informed that taking a particular route is going to be ‘shameful’. In such case it is always better to ‘give up’. Chat Fu Ninja uses the formula of the standard Charades where you have to keep running a conversation with your partner and lead him or her towards using and not using certain words without letting them know that they are into a word game. That requires real expertise on conversation and manipulation, and you have to prove yourself as a ninja warrior of words. 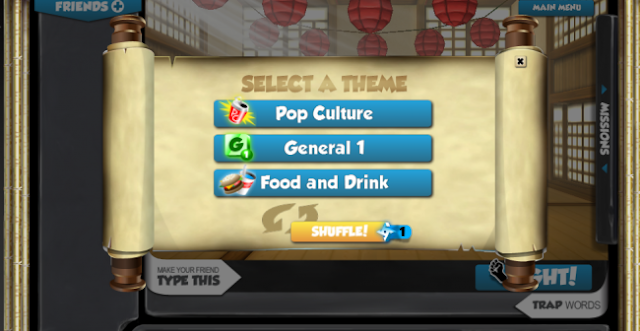 The creativity of Chat Fu Ninja is unique with its sense of humour, as while watching out and manipulating the fight on the screen, you are continuing your conversation as normal as liking a TV show or hanging out with your friends. It really makes you feel jarred up and no doubt it will show up in the intensity and urgency in the words and expressions you type. If you need more excitement and test your skill, you can invite more chat partners to join in and can fight with all of them at a time if you have that word play habit. The only disadvantage of Chat Fu Ninja is its minimized screen, which should be urgently taken care of. You have to have the best screen resolution for it to display properly, otherwise you might end up managing with three scroll bars which disturbs the game flow a lot and doesn’t allow you to concentrate on the words to be typed on time and simultaneously keep a watch at the trap words. We players are waiting Blot to iron out the Chat Fu Ninja inconveniences, and once it is done, Chat Fu wouldn't have much to complain about and it definitely has in its store loads and loads of fun with very simple twists and turns, while you make more friends online. The best part of Chat Fu Ninja is that it trains you as a conversation expert.